Happy New Year to you and yours! I hope you had a warm and cozy holiday season and wrapped up 2015 on a high note. I ended up with a really bad respiratory infection (gross!) and had to postpone our trip to Colorado, so it wasn’t my favorite way to end the year. That’s also the reason I haven’t posted a single thing here in weeks. Thankfully I’m on the mend now after a round of antibiotics, although I still have bit of a stubborn cough. Bring on the new year with fewer germs, please! 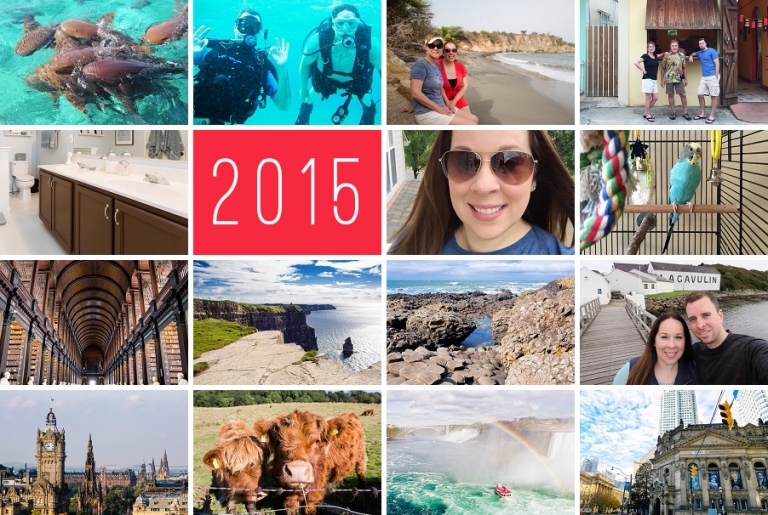 2015 was pretty good to Chris and me in general and we had our share of fun highlights. We both started off the year really strong in our resolve to study hard and get a few professional certifications (work stuff, not pictured below), and we then spent the rest of the year doing my favorite thing: gallivanting around the world together! Our travels took us to West Virginia, Belize, Ireland, Scotland, and Toronto. We also shared a wonderful trip to Vieques with my sister and brother-in-law, something we don’t get to do nearly often enough. Perhaps my biggest moment in travel though was conquering a huge fear and checking off a bucket-list item: scuba diving! Combine that with our swimming with sharks adventure and I have almost gotten over my fear of the ocean. Of course, along with peaks come valleys. From the keeping-it-real files, 2015 contained the following low moments: an icky parasite from Belize (I was the lucky winner of that one), falling into a fresh cow patty while on a hike in Scotland (me again), and missing Christmas in Colorado while I nearly coughed up both lungs. But really, that’s not so bad at all and we feel very fortunate. Here’s to hoping 2016 brings you peace, good health, love, and happiness!